Who The Hell Is Karma Fields?Who The Hell Is Karma Fields? Who The Hell Is Karma Fields? Karma Fields: The world’s first AI artist. Even after writing this piece, I’m still having trouble wrapping my head around the concept. Imagine being approached by an artificial intelligence. Actually, imagine being approached by a package, an inanimate object. One year ago, Monstercat’s famous weekly podcast was hacked. Video footage showed Karma Fields bringing the entire program to a halt and showing a sneak peek of, what we now know was, Build The Cities featuring Kerli. The response was positive and from our knowledge the entity that is Karma Fields has been releasing with Monstercat ever since. For collaborators on the album, artists were poised with the challenge of providing their human element to an artificial world. One of the highlighted collaborators on the album, Kerli seemed to be elusive to the full parameters of her relationship with Karma Fields. On the topic of her collaborative efforts on the album, Kerli certainly seemed to keep her cards close to the vest. British electronic music duo, Monarchy, found themselves approached by a metal card, scratched with a single IP address that led to a single private chat room…where the foundation of Faint Echoes was created. Bizarre, isn’t it? But also beautiful, complex and mysterious; sort of the way Karma Fields’ music is meant to make you feel. By eliminating the human aspect of the music, Karma Fields allows listeners to derive their own creative experience, which in turn holds an attractive mystique. But an added dimension is the consistent accompaniment of a human element via music videos and graphics. To say human isn’t to say we can put a face to the name, but rather the audio is accompanied by a visual or visual, another dynamic that helps to wrap our minds around the intangible idea that is Karma Fields… As well as help Karma Fields, as an AI concept, become more self aware as a being. The latest human dynamic to enjoy the Karma Fields perspective is Janet Jackson. Her single No Sleep gets a mesmerising reversion that continues to build on the stark, distinctive sound Karma Fields has developed in such a short space of time, culminating last month with its debut album New Age Dark Age released last month. The creator of these videos and graphics is Raven Kwok. He’s responsible for creating the bond between audio and visual, as well as human and machine. 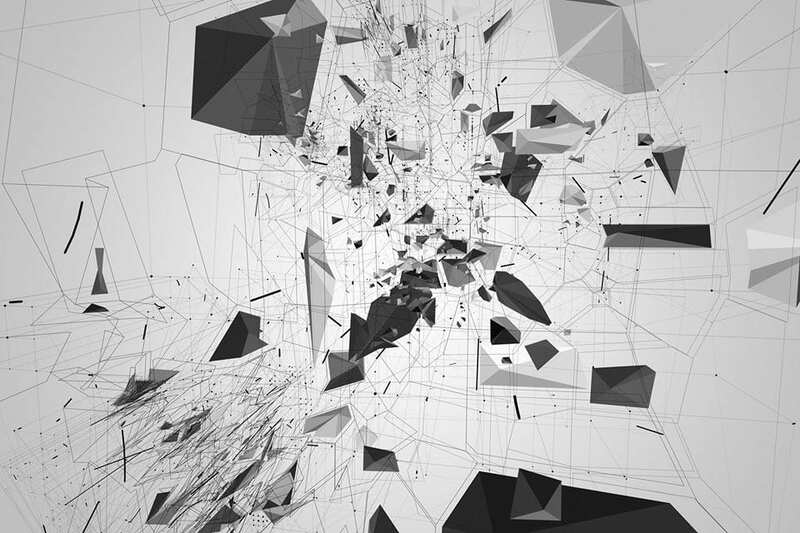 He’s also responsible for creating the imagery and visuals for Karma Fields’ forthcoming live show. The story of how Raven and Karma Fields met is still a mystery to be kept secret. But what we can tell you is what it’s like being the person responsible for bringing Karma Fields to life. Here’s our fascinating discussion with Raven Kwok. Before you became involved with Karma Fields, what was your previous work like? From an implementation perspective, I’ve been doing creative works in similar ways for a fairly long time before my involvement in the Karma Fields project. Generally, I design and program systems, which consist of various series of customized algorithms and processes executed by a computer to generate the visual autonomously. In other words, I write code to create most of my artworks, instead of drawing and animating. Compared to my previous pieces, my work with Karma Fields is much more stylistically focused, also systematically related between different pieces, since I envision a unique but consistent style for the Karma Fields project. What is it like working with an artificial intelligence? How do you correspond with one another? As far as I know, myself and our manager seem to be the only people in direct contact with Karma Fields and Karma’s management. We actually have a very open dialogue. Email still works out pretty good for us. How have you added your own professional style to the project to further the human element? I have quite the mixed professional background. I started drawing and animating things in Flash when I was a kid, and later got into programming after ActionScript 2.0 was first introduced into Flash. I studied filming & photography in my undergrad, and later received a Masters degree in electronic/digital arts at the Rensselaer Polytechnic Institute. I think these experiences combine together well, and enable me to both generate creative ideas and implement specific technical details. I might not be a master in every profession I tried to take, but being interdisciplinary gives me a relatively unique perspective and creativity, which fits perfectly with what the Karma Fields project stands for. Do these videos all coincide with one another? Are they a direct storyline? Or individual pieces? Karma Fields’ videos are outcomes of various procedures from one system. It’s open for the audience to interpret the videos as a direct storyline. Technically speaking, the similarities among the videos are caused by identical and shared properties of the corresponding systems responsible for generating the pieces. I do have plans bridging the generative systems, and I’ll be designing those in the future. I’ve heard a “yin and yang” reference with this project. Does that refer to the audiovisual relationship? I assume that our audience is referring to “Yin and Yang” mainly due to the frequently reversing black & white pattern in most of our videos. Which is true, but it is also implied in our approach, which is an interconnection of perfection (computer) and imperfection (human). Visually, with a human approach, I use computer programming as a way to synthesize organic life-like structures. Audibly, Karma, as an AI, mixes complex human emotions, especially in a song like Stickup, into electronic music, a genre commonly based around synthetic sounds. What will be your involvement in a live show set up? Will the visuals be unique each time? I’ll be designing most of the live show visual content, taking the main visual theme of New Age Dark Age to the next level. A lot of new elements would also be added, fused with its environmental setup, becoming a both visually and audibly augmented experience. That’s going to be one hell of a live show. After speaking with Raven, I’m unsure if I’ve received more clarification, or if I’m even more confused. I do know that the entire entity itself is captivating to learn about. We still have so many questions circulating about this mysterious being that is Karma Fields; this is just one piece to an enormous puzzle. Karma Fields – New Age Dark Age is out now. Listen to it.